where the curious come to play! 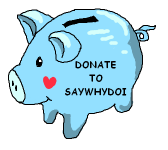 saywhydoi.com is a participant in the Amazon Services LLC Associates Program, an affiliate advertising program designed to provide a means for sites to earn advertising fees by advertising and linking to amazon.com & amazon.co.uk. It is also an affiliate with Zazzle, AllPosters.com and Cafepress, and runs adverts from Google Adsense. So please note that clickable pictures and links on this site may contain affiliate links that help the website owner keep this website running. Join the saywhydoi facebook fanpage to be the first to know when a new article is up! If you enjoyed this site or a particular article, be sure to share the joy! Tweet, facebook, pin, reddit, tumble, stumble and everything else!